A gold watch from the Town of Milton to Sergeant Ed Blampied #663079 has been found by his family in Buffalo, New York. Sandy Barton sent the information and pictures on July 24, 2014. Details and pictures are posted below and the report will be updated to reflect this change. The Milton Time Capsules (Jim Dills) reports on two watches given to the Bradley brothers of Hornby – coincidental but perhaps not Milton Watches! We have added Section 7.6 to the report to cover that issue. Jim Dills has identified another soldier (Lance Corporal W. Durnam #766809) who received his watch in a private ceremony in June 1918. We have now updated the report with details about this watch with Section 7.5. Details on the Milton Watches are now being provided by members of the Internet Horology Club 185. A new link is now available for a separate report on the “Watch Details“. More information will be provided as it arrives – June 3, 2012. S. Morley watch discovered in Hamilton and reported – January 14, 2012(a triple home run as he had an older brother and a cousin that qualified as well – thanks to Greg Melanson for the correction – not two brothers). That is now in Section 7.4 of the report. In all cases where a Gold Watch has been confirmed to exist, the details will be added to Section 7 of the report and the updated report will be posted to the MHS web site. Please check back for updates! Updates are also posted at twitter.com/miltonsoldiers. At the end the Great War (The First World War of 1914-1918), the Town of Milton honoured the Milton Soldiers (urban Milton) with commemorative gold watches. There are records of this in the newspaper archives and the council minutes of that era (1915-1919) and a number of us have personally seen a few of the gold watches given to the soldiers (circa 2010/2011). In 1989, Stewart Wolf tried to solve the riddle of the gold watches, that is to determine the names of the 99 men who received this coveted item (Milton Observer of March 22, 1989). The Town of Milton (Gord Krantz, Mayor) had assisted Mr. Wolf to the best of their capability, but with no resolution (Mayor Gord Krantz letter of April 29, 1988). To the best of my knowledge Stewart Wolf was not successful, as there is no further mention of the project in any of the historical files. Stewart, a member of Branch #136 of the Royal Canadian Legion (Milton) is survived by his wife Irene Wolf and son Brad Wolfe. We do know now that more than 99 watches were issued – that was the number for the 1919 presentations. In total from 1915 to 1922 there were 118 watches presented. The purpose of this review is to provide documentation of what was available to prior researchers, what is available now, and an analysis of the possible 118 candidates to receive the watch. The ultimate goal was to arrive at an authoritative list of the most likely candidates for those 118 positions. With the existing watches and that list, a memorial to the Great War Soldiers who received these mementos could finally be created. This is a work in progress and as of the date of this posting the primary resolution of the mystery is only somewhat complete – but it will never end as we are continuing to receive more information about “known watches”. Since the first version of the report was completed, we had received confirmation that two gold watches (Ptolemy Family, Beasley Family) are in existence, however we have not seen the watches. Watches to those families have been recorded in the list of the 118 issued and they have been added to Section 7 of the report. As a result of the web site publication about this project, we were contacted by a watch collector (Aaron Day) in the UK (South Yorkshire) who had a MILTON GOLD WATCH and wanted to return it to the project. That process was completed and the watch arrived in Milton on October 25, 2011. The watch is a very special addition to the project as it was the one issued to the family of Private Ernest Baverstock (#142260) who died of wounds in France on October 1, 1916. 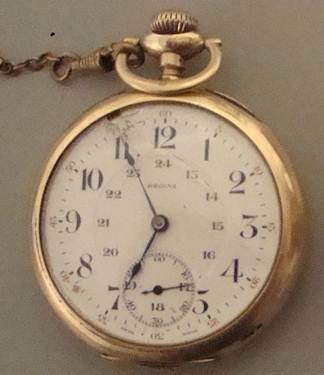 This is the only watch we have seen from the July 1, 1917 Dominion Day Ceremony in Milton and the watch is distinctly different from the one issued to Private Regan. In 2012 we received information about two (2) new watches for the families of Samuel Morley (#3110037) and William Durnam (#766809). The “Morley Watch” was confirmed by Greg Melanson who has the watch and has provided photographs, whereas the “Durnam Watch” was confirmed by the review of our Jim Dills and there is no physical confirmation. The details of these “finds” has been added to the most recent update of the MHS Gold Watch Report. The information on the Durnam Watch suggests that it is now necessary to return to the MHS Newspaper Archives to search all of the Milton Canadian Champion articles of 1918. Section 4 of the current report ends at the 1917 list. These are now included in Sections 7.4 and 7.5 of the most recent report. In 2013 we discovered information about two (2) “Waltham Watches” that went to the Bradley brothers of Hornby, Ontario. Although probably closely integrated with Milton at the time, it is unlikely that the Hornby lads would have qualified for the “official” Milton watches, but is it coincidental then that they were of the same type and from the same jeweler? To make sure the topic was address, a new update (Section 7.6) was added to the report to cover the Bradley issue. Perhaps one day a Bradley watch will appear? Here is the comparison of the two watches I have in my possession: (they both keep excellent time although both are damaged). Information on NEW WATCHES (not in my possession) follows. Unknown “winged emblem” A.W.C. CO.
On January 14, 2012 we received an e-mail from Greg Melanson in Hamilton, Ontario that he was in possession of the Gold Watch that was issued to Samuel Morley (#3110037), who after the war had returned to Milton. All that remains of the watch is the outer case and winding post. The watch is of the “Regan” style, as shown in the photograph. Details on the origin of the watch and how it reached Greg are detailed in the updated report now posted to the web site. At the time of the initial posting I did not realize we had achieved a “Triple Bonus” with the finding of the Morley watch. In the process of updating the main report it quickly became clear that Samuel Morley had an older bother (William Alexander) and a cousin (William James) who also are now known to have met the residence qualification for a gold watch. All three were listed in the report as “MP: Most Probable“, a fact now confirmed. In July 2014 we received an e-mail from Sandy Barton in Buffalo, New York who had found a Milton Gold Watch in the personal effects of her mother-in-law who had recently passed away. You will find a picture and story about Ed on page 170 of the MHS WW1 Remembrance Book. The discovery of Ed’s watch is the first time a watch has been confirmed that is not in our selection list. Initially considered a “likely candidate” for a watch, he was probably dropped as it was believed he had gone to B.C. to join the 102nd Battalion. In actual fact, the 102nd had come to Ontario to find new recruits, where it was renamed the 102nd Central Ontario Battalion. Milton Privates Crowe and Atkinson were also with the 102nd. The final report is complete but remains open for updates. I would not only welcome – but appreciate – input from anyone who wished to review, comment on, or critique this report. Since the completion of the initial report a new SECTION 7 has been added for PROJECT UPDATES. In that section there will be updates on the watches that are located (currently Ptolemy, Beasley, Baverstocok and now Blampied). In previous versions of this web page, a listing of the changes to the report and spreadsheet were document for the benefit of those tracking the progress of the research. In total, there were nine (9) versions of the spreadsheet analysis, which highlighted the approach to arriving at the 118 soldiers names. Those versions have now been removed, but are available on request. A draft final PDF version of the report, with a significantly reduced file size can now be viewed on-line at ISSUU or downloaded from the MHS web site. A separate version of the EXCEL spreadsheet is also available, as it is difficult to read the PDF version. I will update these on-line reports as new information is added. As always, I welcome the input of fellow members of the Milton Historical Society, the Royal Canadian Legion, and the members of the public that may have additional information. If you can confirm that a soldier did receive a gold watch, or alternatively that they never qualified for a gold watch – PLEASE let me know. In the end I may arrive at “the most likely list of candidates” but I doubt that it will ever be perfect.